The First Amendment to the United States Constitution prevents Congress from making any law prohibiting or abridging the freedom of speech and the freedom of the press. However, private corporations are not being held accountable for their efforts to suppress and threaten a robust media and press. Communities throughout the United States that are considered to be media deserts—places with a lack of diverse print and digital news coverage—are hit the hardest when their papers are owned by private investment firms and corporations such as Alden Global Capital/Digital First Media. Today in the United States, news matters more than ever. It is important to protect journalism at all costs. When journalism is censored and manipulated by those in power, it is an outright threat to the democracy that the United States was founded upon. Due to the instability of Denver’s current media climate, it is critical that the local community stay informed of the attacks on the journalism community in order to preserve the fourth estate. PEN America strives to ensure that people worldwide have the freedom to convey information and ideas, express their views, and make it possible for everyone to access the views, ideas, and literature of others. By cutting staff reporters and censoring critical voices, corporations that own news outlets throughout the country are placing business interests before journalistic integrity. Such practices pose great danger to the communities these outlets were established to serve. Digital First Media owns 97 newspapers throughout the country, including The Denver Post. Over the span of 6 years, The Denver Post has cut its staff to roughly 70 employees. 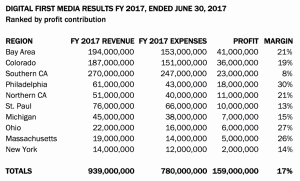 Profits as recent as June 2017 from The Denver Post are up to 19 percent. However, that profit is not being invested back into The Denver Post’s reporting staff nor its office facilities. Attempts by Denver’s local journalists to bring these business practices to light have been met with blatant censorship. In early April 2018, The Denver Post’s editorial board published a piece calling for its owners to support journalistic integrity over monetary profit. This was followed by the Post’s sister publication, the Boulder Daily Camera, firing Editorial Page Editor Dave Krieger after he self-published a controversial piece about Alden Global Capital on the Boulder Free Press blog. Less than a month later, Editorial Page Editor Chuck Plunkett of The Denver Post was told that his critical reporting on Alden’s profit margins would not be published. In response to this censorship, he resigned. Free press advocates in Denver are calling for Alden Global Capital to sell The Denver Post. Ricardo Baca, a lauded voice in the cannabis journalism community, wants to buy The Cannabist from Digital First Media after launching the Post’s marijuana section in 2013. What will the state of journalism look like in Denver five years from now? How will Colorado communities stay informed about politics, transportation, education, and other critical issues of local importance if there are fewer than 70 reporters to cover the entire state? How can news consumers find diverse voices within the news they read? Short answer: They won’t be able to. The role of the newspaper is to keep its readership informed of pertinent issues ranging from global concerns to local items such as transportation, politics, education, among others. Journalists therefore provide readers with the ability to consistently and comprehensively check those in power. Media outlets constrained by owners must be as transparent as possible, and must not allow profit margins to interfere with journalistic ethics and standards. In order to keep residents informed, owners cannot censor material. It is a threat to democracy. It is a threat to information access. It is an attack on news consumers. While Krieger had the opportunity to self-publish a plea to his paper’s owners, he was quickly handled by termination of employment. How can journalist provide quality journalism if the owners don’t allow ethical reporting? The people in power are controlling what gets published. This not only happens nationally, but more specifically in media deserts. There are no diverse voices for local issues. Many people may be under the assumption that the paper does not provide a desirable product at an affordable price; however, the editors and reporters are being constrained from publishing their content by heavy oversight from their hedge fund owner’s chief operating officers and management. A lack of coverage in Denver and other Colorado communities leads to diminishing trust and transparency that media outlets have built within different communities over time. In regards to owners, profits are more important than quality journalism. As Ken Doctor states, the losers of this battle between the Post and its owner are the readers and communities within Denver. For more ways to support good journalism, check out these suggestions from writer Anna Clark.